This is the second feature in Tech and Reentry, a series profiling organizations in the field of corrections and reentry that are using various forms of technology to improve participant engagement, streamline service delivery, and enlist volunteers. Low recruitment numbers. Poor attendance. Lackluster quarterly reports. These are concerns that burden many nonprofit, community-based outreach programs around the country. 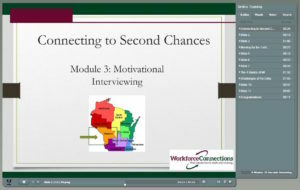 However, for Workforce Connections Inc., an organization that serves people returning to their communities from incarceration in western Wisconsin, these problems were heightened by the rural and semi-rural environments from which the organization draws both participants and volunteers. Workforce Connections found ways to tackle these issues specifically in the delivery of their mentoring services. Workforce Connections’ reentry mentoring program, Connections to Success—a 2014 Second Chance Act mentoring grant recipient—serves men and women returning to an eight-county catchment area from both local jails and state prisons. The total population of the entire eight-county area is only roughly 310,000 people spread out over more than 6,000 square miles, which makes access to crucial reentry resources significantly more difficult than it would be in more populous urban areas like Madison or Milwaukee. In addition to their focus on employment success, Workforce Connections also offers education and technical skills training, family support services, cognitive interventions, and connection to substance use treatment, among other services. The Connections to Success mentoring program was intended to extend and increase engagement in these services for people returning from jail or prison. Recruiting volunteer mentors proved difficult at first, as Workforce Connections initially required an eight-hour, in-person training session for new mentors. “We were finding that most of the people that would be interested in being a [mentor] for us had a really hard time committing to being in person in training, because they were looking at juggling careers themselves, as well as families and other responsibilities,” said Kelly Norsten, the Second Chance program manager at Workforce Connections. Seeking solutions to low recruitment numbers, they tried splitting the eight-hour training into two four-hour sessions, but they continued to see low attendance numbers from potential volunteers. Management at Workforce Connections soon realized that they needed to completely rethink how their training was structured. “Being [in] such a rural area, we have to get a little bit more creative,” Norsten said. They decided to move their mentor training online. The organization invested in Adobe Connect and Adobe Presenter software so that Mentor Coordinator BethAnn Zenk could turn the training into a four-part, interactive online training. The four modules contain all of the information that was covered in the in-person training, with a quiz after each module to assess understanding. “One of the most exciting things about the online training is that it allows us to tap into a population … we were missing out on that was interested and willing but just didn’t have the ability to be here for eight hours for training,” Norsten said. Mentors in training have the option to complete all four modules at once or to go through the online training at their own pace. In an effort to balance self-pacing with efficient preparation, Zenk used the Adobe software to tell trainees how long each module should take and to set a completion deadline of two weeks for all four modules. After completing the online portion of the training, new mentors schedule an in-person meeting with Zenk to finalize the orientation process, discuss the content covered in training, and begin the process of being matched with a participant. 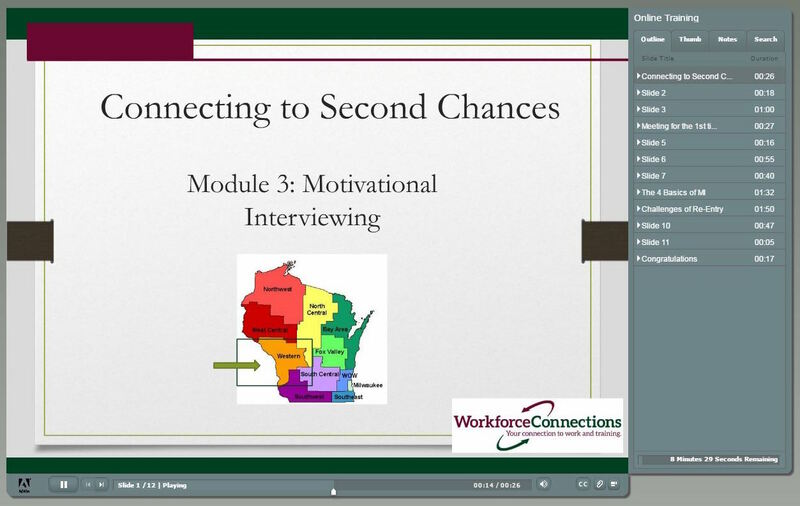 After piloting the online training with a handful of mentor recruits, Workforce Connections was able to fix some lingering software glitches and finalize the training process. Program administrators were initially concerned that some potential mentors may not have Internet access at home, but so far that has been a nonissue for volunteers, who simply go to a library to access the training if necessary, or even use the on-site computer lab at Workforce Connections’ office. The benefits of having online training were immediately evident to Zenk, Norsten, and other program staff. Potential new mentors have expressed more willingness to go through the training process. And Norsten says that one of the biggest benefits has been having the mentor coordinator’s time freed up to focus on recruiting; Zenk was no longer tied to eight-hour trainings every few weeks, nor did she plan and schedule trainings that then had to be pushed back or canceled due to low interest. Having tackled the problem of enrolling volunteer mentors, Workforce Connections faced another challenge: participant engagement. “The population that we were serving was just so transient in nature that we were having a really hard time being able to stay in contact with them,” Norsten said. According to Norsten, potential mentoring program participants might have an address one day, but not the next, or one phone number one day, and a different one the next. Participants also faced competing priorities such as securing employment, reuniting with families, meeting the requirements of community supervision, and other overwhelming demands of reentry. Still, Workforce Connections staff planned events for mentors and participants to interact, but attendance was low. Once again, Workforce Connections started thinking outside the box, this time about how to engage participants more consistently. They eventually came up with a way to incorporate social media into their outreach. So in Spring 2016, Bob Matthews, employment coordinator for Connections to Success, created a closed Facebook group administered by Workforce Connections staff where mentors, participants, and staff could share success stories, schedule events, and post other helpful information. “Social media helps us meet the people where they are … and on their schedules,” Matthews said. Participation in the Facebook group is voluntary for both mentors and participants. Because the group is closed, a new member can only be added by one of the group’s administrators. Group members also have the option of joining with their personal Facebook account or creating an account specifically for the group. These measures help to preserve privacy and make sure that the group creates a positive and productive space for mentors and participants. According to Norsten and Zenk, they haven’t had to remove anyone from the group and have had only one incident of a negative interaction on the group page—an issue that was quickly resolved. The group “has been a safe, positive space for our participants to congratulate each other and pass along encouragement,” Matthews said. In addition to providing a platform for mentors and participants to support and encourage each other, the Facebook group has also helped to increase attendance at mentoring activities and group meetings. Staff see this added benefit as one way to ensure that connections among mentors, participants, and staff are not just made online, and that the importance of in-person interaction is not lost even as they continue to use social media to facilitate communication. “If we can show [participants] that we are actually invested in their success and that we care about them not only from a programmatic standpoint but from a personal standpoint too … I think that makes a big difference,” Norsten said.